Driving in crazy city traffic, hours of siting on the computer and a sedentary lifestyle can take a toll over our bodies as well as spirits. Though I try to balance my sedentary lifestyle with a good workout at the gym 5 days a week, I sometimes feel, my body needs more. More pampering, more relaxation and more peace. And it is at such times, I decide to visit a spa. Because if "YOU" don't pamper yourself, who will? I was invited by the Heaven on Earth Wellness (HoE) centre, to visit their spa and experience their services. Heaven on Earth Wellness is now one of the largest wellness houses in the country. 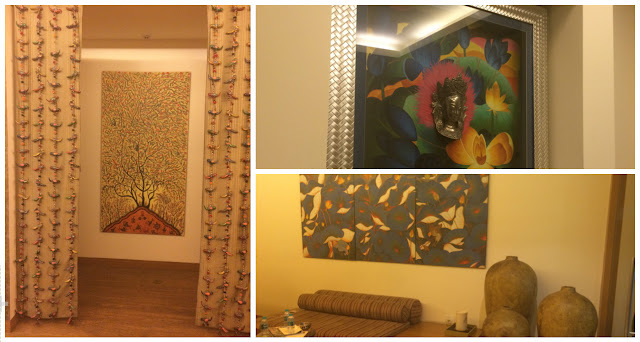 The INR 20 crore-company, was also the first to introduce the concept of spa & art in India. Consumed by the idea of providing a wellness space for people who struggle with balancing work and leisure time, the HoE team committed their time to create the ultimate wellness experience for guests. With the mission of “offering a harmonious mix of Indian and International holistic techniques to enhance overall wellness.” Heaven on Earth today delivers wellness experiences in 40 spas across 4 countries in airports, resorts, hotels, hospitals and high streets. For my review, I chose the Aristo Spa at the Four Points by Sheraton Hotel in Navi Mumbai. Located on the third floor of the Four Points by Sheraton hotel, the Aristo Spa is a compact spa with eclectic decor and relaxing vibes. Once I got comfortable, I was introduced to the different therapies and their benefits, that Aristo Spa offered and believe me I wanted to try all. I was so tempted to try their Red Rice massage where they used a mixture of red rice soaked in home made yogurt for massage, but I finally decided on the Deep Tissue massage which is apt for people who work out at the gym. I was taken to the massage room and I absolutely loved its setting. The massage room had an inbuilt Jacuzzi and steam room. The massage started with the therapist wiping off my feet with wipes soaked in warm water. I was instantly relaxed and ready for the massage. The therapist used fragrant aroma oil for my massage. The massage began from my feet and moved to my upper body. With each stroke the therapist asked me if i was comfortable with the amount of pressure she was using on me. I reaffirmed she was doing a good job. The therapist also, stretched my limbs from time to time, just like fitness instructors do after a heavy workout at the gym. Post 60 minutes of bliss, it was finally time to go for Jacuzzi. After a relaxing Jacuzzi session I proceeded to the steam room. The steam not only opens the pores of your skin, but relaxes your muscles too. I was a happier and relaxed person when I walked out of the massage room. I recommend, after a hectic week, this is one way you should definitely unwind. The 60 minute Deep Tissue massage costs Rs. 3,500 and the steam and Jacuzzi Rs. 540. I rate this spa 3.5/5.